A big part of my peace message is honesty and openness, which includes revealing my mistakes. For whatever reason: I had too much going on and missed a detail, communication got crossed, Mercury is in retrograde... I made a mistake - a BIG one by writing the title of the book in my review wrong. The correct title is China through a Glass of Wine and if you were looking for the book after my fictitious title, you may have been frustrated. 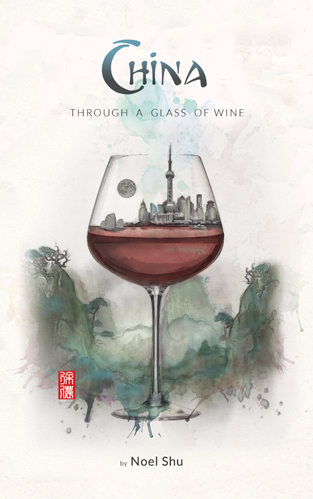 So here is the corrected review with link to how to find this fascinating insight into the Chinese culture through viewing their emerging wine industry. On a journey of joy through the pallet, I encountered the book, China Through a Glass of Wine by Noel Shu. This 130-page book grabbed my attention with the idea of the pleasure of wine espoused with an adventure into a somewhat mystical ancient culture. China Though a Glass of Wine is actually an insightful picture of current day China relating to the world while striving to maintain the Maoist culture. Personal life, politics, commerce and wine blend in the telling of how a malleable Western mind could succeed in the Chinese society and market. Even though the book is targeted for the wine industry, it reveals great insight for anyone willing to accept the increasing need to understand cross-cultural interactions with China and the West. "From the streets of New York's Chinatown, to the Helan Qingxue at the foothills of Helan Mountain in China, never would I have imagined sipping my way around the world and telling the untold stories of the Chinese wine industry", writes Shu. Shu describes the history of wine making in China, including the influences and investments from prestigious wine makers in France and Italy. The story includes the huge problem of counterfeiting wines. Laughable accounts of clumsy copy attempts on well known brand wines that sold to high bidders on the international market are recounted through interviews with wine experts. Shu gives background information to how the Chinese reason and try to succeed in commercialism while impacted by government control. He also gives quite thorough insight for companies coming from outside China to understand how to succeed in the Chinese market. China Through a Glass of Wine describes many of the wines available in China and how they compare to wines around the world. He includes his view of market probabilities for both the Chinese consumer and international wine lovers. One wine described, Chateau Henson's Rimage de Cabernet Gernischt, Valley du Wuhai 2010, caught my attention with the description as a quirky wine with aromas of Lapsang Souchong, licorice and blueberry (some of my favorite flavors). The author explains that most Chinese wines are not available outside of the country, because they cannot keep up to the national consumption to be able to produce for the international market. Another downside described is price. Shu explains that the Chinese value an item by the price, not necessarily the quality. So a favorite wine sells for $600 per bottle, while it has the quality of a $60 bottle. If you are a wine enthusiast, interested in doing business in China or simply love to learn about cultures in the world, you could thoroughly enjoy this book.